The Omon was the main gate of the Yoshiwara brothel district in Tokyo. Originally created in 1617, Yoshiwara was first located near Nihonbashi, but it was moved out of the city to a spot nearby Asakusa during the second half of the 17th century. It was surrounded by a moat and had a single guarded entrance gate, the Omon. 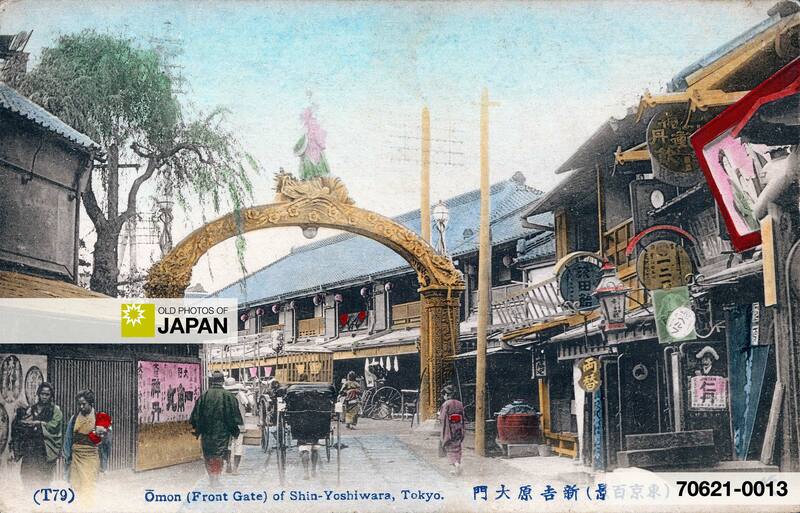 The original gate was made of wood and had a crossbar in a style called Kabukimon (冠木門). It was replaced by a wrought iron gate in the spring of 1881 (Meiji 14). This gate consisted of two disconnected posts with gas lights on top. The posts were later connected with an arch featuring a statue of the goddess Benten. The poem consisted of four sentences of four characters each and referred to two popular customs of Yoshiwara. In Spring, cherry trees were planted along the center of the main street, Nakanocho. In the evening, when thousands of colored lanterns and flashing electric lamps lit up the sea of light pink blossom and women in gorgeous kimono, it must have appeared like a scene from a fantastic dream. At present, in the month of August every year, a large lantern, on which is a painting from the brush of some well-known artist, is exhibited in the centre of the Yoshiwara at Naka-no-cho for the purpose of attracting people. Besides this show-piece, revolving and other lanterns of various shapes and designs are hung in front of the tea-houses and lit up nightly. Under these circumstances many persons—not excepting women—flock into the Yoshiwara to witness the brilliant spectacle, and many a prodigal is induced to squander money there by reason of the lanterns which apparently only serve to dazzle his eyes and obscure his reason instead of enlightening him and guiding his footsteps. The general style of lantern is vertically long but narrow in breadth, it being made of silk stretched on black-lacquered frames. It is supported by a pair of cedar poles covered with ichimatsu shoji by way of a roof. Each house is provided with a pair of these lanterns, one facing the street and the other the interior of the building, so that one can be seen from either side: this arrangement has nullified the old saying “toro wa ura kara miru, niwaka wa mae kara miru” (“look at the lanterns from behind and the niwaka dance from the front”). One writer observes that as late as the 20th year of Meiji (1887) the lanterns placed in front of the tea-houses faced the streets, and were therefore only seen to advantage by pedestrians, while actual guests who went up into the second story of a tea-house had to content themselves with looking at the rear of these lanterns. The present day fashion would seem to be of very modern origin indeed. After the 10th year of Meiji (1877) the tea-houses in the Naka-no-cho hit upon the novel idea of putting up white cloths at the entrance and making displays by means of magic-lanterns, but as this made the Yoshiwara practically a dark world it occasioned great inconvenience to the guests. From time to time the tea-house-keepers have shown themselves very ingenious in getting up new schemes to attract visitors, and on one occasion they displayed and artificial moon on a screen so contrived as to show the movement of clouds flitting across its face: all these displays are reckoned as making up one of the notable events which take place in the Yoshiwara yearly. According to the old custom, every year, from the last day of the sixth month to the last day of the seventh month, bon-doro (lanterns erected at the festival of the dead) were shown by all the tea-houses in the Naka-no-cho, but they were not exhibited in front of the small brothels in side streets as at present. The exhibition was suspended on the 13th and 14th days, and after the 15th day new lanterns called ni no kaeridoro were substituted. The lighting of lanterns in the 7th month of the year, during the festival of the dead, was a universal custom in Japan from olden times, and therefore lanterns of various shapes and sizes were used in the Yoshiwara also. The “Yoshiwara Taizen” (吉原大全) says that one summer a popular yujo named Tamagiku was taken suddenly ill, and that after lingering for a little while she passed away at the beginning of the 7th month. The Yoshiwara Omon was destroyed, as was most of Yoshiwara, in the Great Kanto Earthquake of September 1, 1923. You can also licence this image online: 70621-0013 @ MeijiShowa.com.